One policeman even joins in. 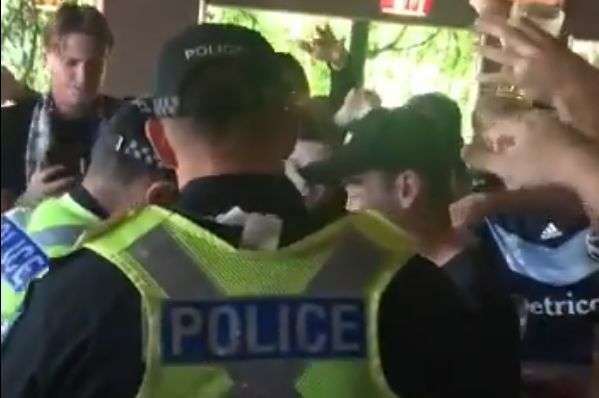 Melbourne Victory fans celebrated wildly after police searched one of them for flares and found nothing before Wednesday’s 2-0 defeat at Adelaide United. After crowding around the scene of the frisk in vocal anticipation, the supporters then erupt into boisterous celebrations when the man is given the all-clear. One policeman even appears to join in, visibly bouncing in this clip. Goals from Craig Goodwin and Ken Ilsø gave Adelaide the win at the Hindmarsh Stadium, although Melbourne Victory remain 2nd in the Australian A-League. They are managed by Kevin Muscat, a former Crystal Palace, Wolves, Rangers and Millwall defender who was notorious for his aggressive style of play.